"Pressure from the driving public to reduce traffic congestion and delay s associated with road maintenance and repairs have made our members toiling in work zones at night a common sight. Unfortunately,this adds to the risks that are always present when a jobsite is alongside a busy highway," says LIUNA General President Terry O'Sullivan. Bureau of Labor Statistics data shows that 37 percent of work zone fatalities occur at night. Some believe these tragedies happen because there may be more drunk or sleepy drivers on the road, because traffic is faster at night and because truck traffic is often higher. Regardless of why, it is important to have good signage and traffic control devices at night to properly warn motorists and regulate traffic through the zone,” O’Sullivan says. “It is also important for workers to be clearly visible to motorists. High-visibility garments and well-lit work zones are essential to worker safety and health." ANSI standards and the DOT’s Manual of Uniform Traffic Control Devices require Class 2 garments for day work and Class 3 garments for night work. Class 3 garments have reflective material on both pants and sleeves, which makes it easier for motorists to identify the worker as a person because they can see the legs and arms moving. Garments now use “retro reflective” material which reflects light from oncoming headlights very well. This is referred to as “passive illumination.” These materials get dirty, though, and they need to be cleaned or replaced periodically to maintain effectiveness. However, workers can be invisible if headlights are not shining on them directly. For this reason, many companies are now using vests and hardhats with LED lighting on them. This is called “active illumination.” Lighted vests and hardhats can be seen from a great distance and can flash or change colors. The only issue to address is battery life. Batteries will normally last a full shift but need to be recharged each night. At a minimum, workers must be outfitted with ANSI-approved, clean, passively illuminated work gear and provided active illumination gear when at a high risk of runovers. Making sure workers are visible is not the only lighting concern in work zones. Construction jobs can be hazardous work and poorly lit nighttime worksites increase worker exposures to common construction hazards. Many injuries from trips and falls occur at night in poorly lit work zones. Poor lighting often causes shadows that can hide holes and tripping hazards. To address nighttime hazards, every night job needs to have a lighting plan. Balloon lighting can provide more diffuse lighting that results in less glare and fewer shadows. Light towers are normally set up to light the work area effectively, but they must be positioned to avoid creating glare for drivers. If flaggers are used at night, a light tower needs to be dedicated to the flagger station. Backup generators are needed in case of a power failure. 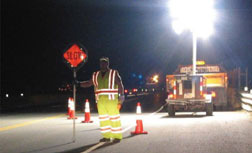 Combining high-visibility garments with sufficient work zone lighting creates a safer environment for both workers and motorists. The LHSFNA’s OSH staff can assist contractors in developing effective night work zone safety plans. For assistance, call 202-628-5465.